Read about our research. Find out how Meissa differs from our other available tools and how it can integrate with them. I had the task to perform research and think of a way to solve the problem. I read everything I could find for a couple of days, besides all the solutions I know from the companies I worked for in the past. The truth is, for seven years, the way people execute their tests has not really changed. Additionally, in my research we asked our followers a similar question in our survey: “Do you run your tests in parallel? If YES, how?” Their answers were almost identical to what I read. 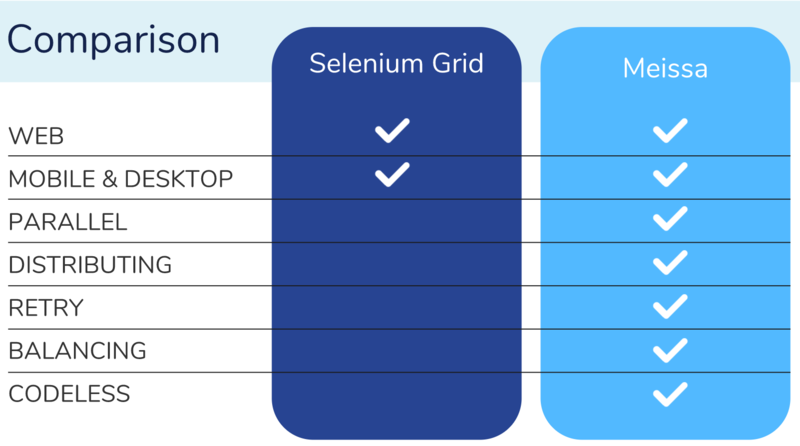 The most common practice is to run your tests in parallel, based on the machine cores, and to leverage on the Selenium Grid if we are talking about UI tests. However, this solution has a couple of drawbacks. For example, most native runners can run tests in parallel only if they are in separate projects/containers/libraries. Meissa can run tests without additional attributes/annotations/configurations added to your source code. Using it makes the onboarding of the parallel tests execution easier and faster. If you use the in-parallel feature of your native runner, excellent! You can use it side by side with Meissa. The tests will be run with the same speed, you will have all the other benefits of Meissa, and most importantly, you will be able to distribute them on multiple machines. Some popular solutions for testing environments now utilise Docker containers. One of my favourites is Selenoid. It is a Selenium Grid on steroids that gives you clean installations of specific browsers each time in dedicated containers. It is excellent for WebDriver tests if you test on Firefox, Chrome, or Opera. How does the Selenoid tool differ from Meissa? Well, it is not a test runner. You still need a way to execute your tests in parallel if you want to run your tests simultaneously. I considered it during my research. However, there were a couple of limitations that stopped us from using it. The tool doesn’t use containers for InternetExplorer and Edge. It doesn’t support Appium and running desktop apps. It is built primarily for the major browsers. Of course, it is open-source, and you can create new images on top of the existing ones, but for me, it is too much effort to make it work for these scenarios. 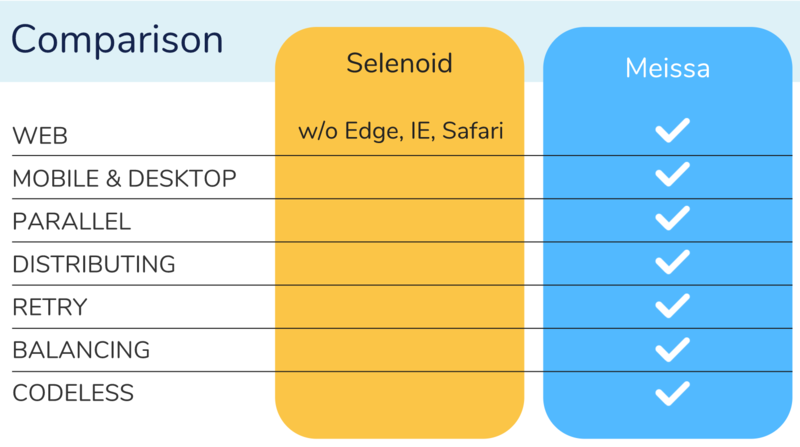 Most points are valid for the standard Selenium grid and its tuned versions, such as Jsonwired-Grid, Gridrouter, Selenograph. They are no test runners; they just give you browsers/devices configurations. If you run your tests on one process, even if you have 100 hub nodes, your tests will be executed one by one. So, you can use these tools together with Meissa to run the tests distributed. Because of the lack of tooling, some people use their CI systems to execute their tests. 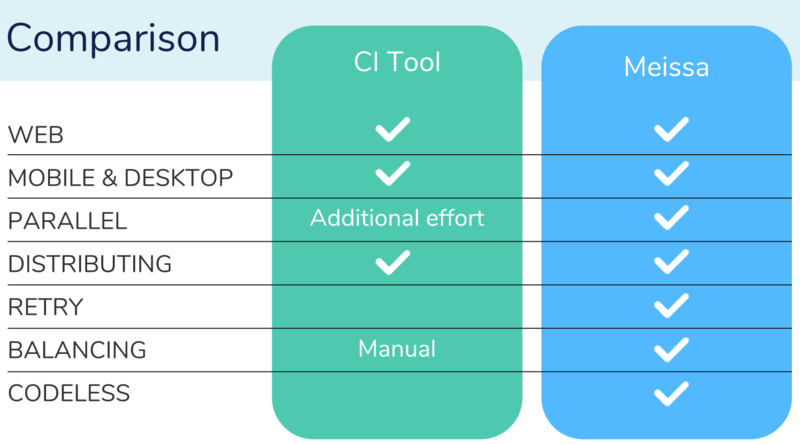 The usual practice is to mark each test with attribute/annotation, such as Machine1, Machine2, and then use the slave/build capability of the CI tool to run them on these machines separately. However, for me, this is unacceptable since the ‘balancing’ of the tests is manual and the test execution time is equal to the time of the slowest slave’s sub-run. Moreover, when you add or remove tests, you need to calculate that time yourself. With Meissa, the whole process happens automatically without modifications of the tests source code, and the runner produces a single test results file. Most of the time, I like the Microsoft tools. 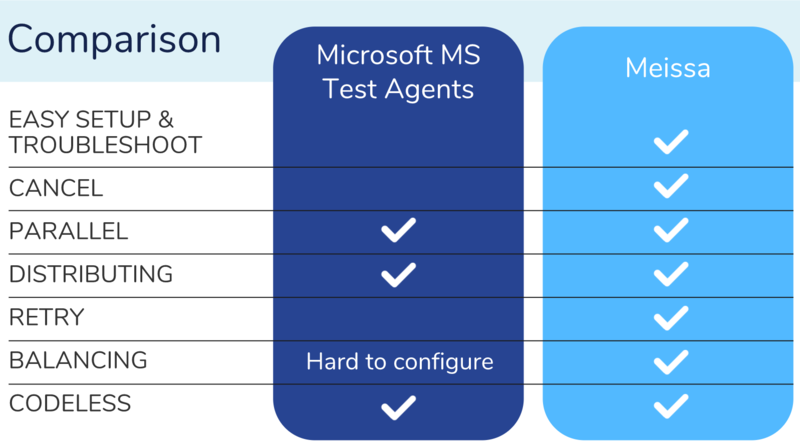 In my previous companies, we used MS test agents, but they have a few flaws. It is unpredictable how the tests are balanced.. They are hard to set up and troubleshoot, and the documentation is missing almost entirely. Last, they can run tests only on the Windows platform. And if you cancel the build, the machines can be left in an inconsistent state with open browsers and so on. Meissa is cross-platform and simplified to maximum, including everything you need in a single CLI. Moreover, it has the most essential features of the MS distributed tests runner but can handle adequately any cancellations and execution issues.